The National Park Service (NPS) recognized Southern Utah University’s Director of Outdoor Engagement, Dr. Briget Eastep, as a recipient of the 2016 Director’s Partnership Award. The Director’s Partnership Award is a distinguished honor from Jonathan B. Jarvis, director of the NPS. 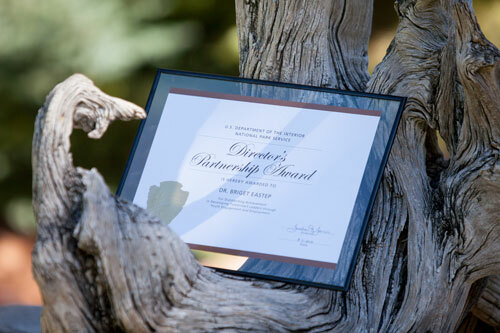 As the Director of Outdoor Engagement, Eastep received this recognition because of her work for SUU’s Intergovernmental Internship Cooperative (IIC), which develops tomorrows public land leaders today. Eastep was a founding member of the IIC in 2007 and helped place 15 students in internships during the first year. Now the IIC has grown to offering roughly 300 internships in regional and public lands with more than $6 million in cooperative agreement funding. The IIC partners with 19 federal and state land agencies, the Paiute Tribe, and SUU to place students into employment, internship, and volunteer positions. These opportunities provide ‘real world’ work experience that can complement a student’s academic pursuits and help prepare them for a successful career in public lands.